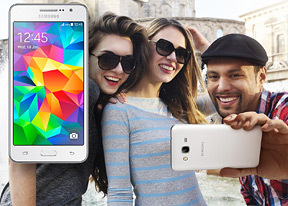 The Samsung Galaxy Grand Prime has a solid (on paper) back camera, but is also quite proud of its selfie camera. The front-facing camera features a wide-angle (85°) lens and a 5MP sensor. It can record 1080p video, so you're not limited to selfie stills either. The camera on the back shoots higher resolution photos, 8MP, and also records 1080p video. This one also gets a single LED flash. The camera UI is standard TouchWiz though it lacks some of the features of the flagship models. What it does have is ISO, exposure and white balance controls, image effects and geo-tagging. Special shooting modes include panorama, Best photo and continuous shot, plus situational modes Night and Sport. Strangely, there's no HDR mode. Switching to the selfie camera automatically puts it in Beauty face. The mode auto-enhances faces, but there's no slider to adjust the strength of the effect. Another mode is AGIF, which creates an animated image that is easier to share on internet forums than a video. You can shoot up to 20 frames and adjust the playback speed and resolution. Both these modes are available for the main camera as well. 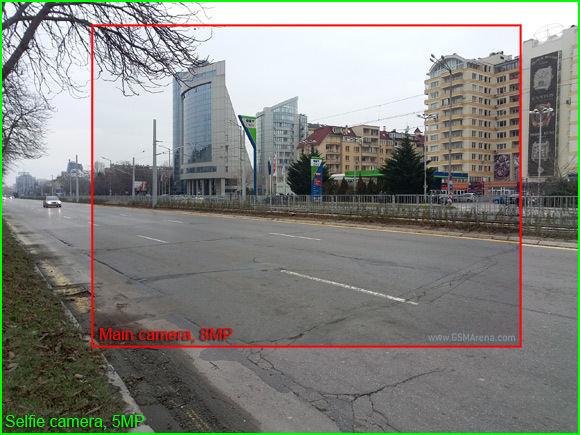 As for image quality, the Galaxy Grand Prime's main shooter is below Samsung's best 8MP efforts. The dynamic range isn't very wide, but that's made worse by the heavy processing and sunlit light colors often end up overexposed, while shadows remain dark. With no HDR mode, there's nothing the help the camera in difficult lighting conditions. Colors are not oversaturated, but the red channel looks off (leaning towards magenta). Noise is kept low, but the work of the smudgy noise-reduction process is visibly up close. Over-sharpening artifacts are visible too. The final result has less fine detail than the best 8MP shooters, but okay for the price range. The front-facing camera is wider than the main camera and it's lower-resolution to begin with, so we weren't expecting its photos to be as good as the one on the back. Also, this is a fixed-focus camera it has been optimized to shoot nearby objects, so the background is noticeably softer. Colors appear duller and the dynamic range is smaller, there's much more visible noise too. Still, the resolved detail up close is quite good for a front-facing camera. Panoramas shot in portrait mode are around 1,200px tall, while those shot in landscape are about half that. The shooting process is simple (sweep the phone left or right) and goes smoothly, the mid-range chipset didn't slow things down a bit. Image quality is quite good - the weather was terrible, but the stitching shows only small issues (mostly around moving cars, which is unavoidable). The photo quality comparison tool allows you to compare the Samsung Galaxy Grand Prime against similarly positioned handsets. The Samsung Galaxy Grand Prime offers surprisingly high end specs for video recording - it shoots 1080p@30fps at best, with 17Mbps total bitrate and 256Kbps audio bitrate (in stereo at 48kHz though we only found one mic). Those are comparable to the base 1080p mode of the Galaxy S5. The front-facing camera uses the exact same settings for video. High-FPS modes are missing though, even at lower resolutions. The video quality from the main camera is quite good, it performs better than it did on stills. The videos are smooth and pack a good deal of detail though some compression artifacts are visible (17Mbps should have been enough). Colors and dynamic range are similar to the still camera. One thing that bugged us is that the continuous autofocus is much too eager. Moving to the front camera, there's more noise though in moving pictures it's not quite as annoying as noise in stills. 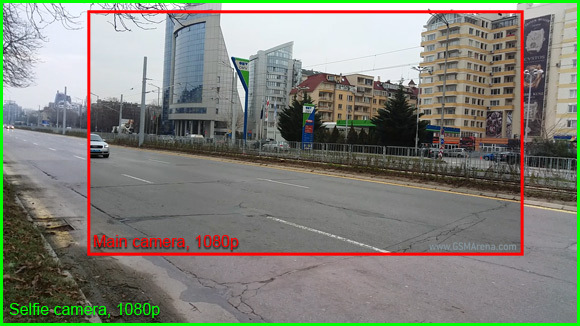 You can also directly download the - 1080p@30fps (0:10s, 21.7MB) from the main camera. If you want to pixel peep deeper in the Samsung Galaxy Grand Prime's footage you're welcome to give our video comparison tool a try.